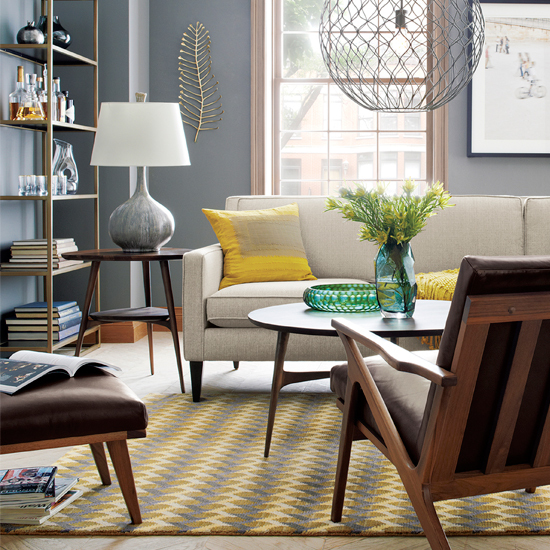 2014 saw the launch of Genevieve’s collection for Crate and Barrel. An exciting and significant collaboration with a major, and very covetable, American brand. Using sophisticated print, embroidery and tufting techniques for a collection including rugs, bed linen, and home accessories. The timeless, cool elegance of her signature geometric and floral designs quickly became amongst their best selling collections. 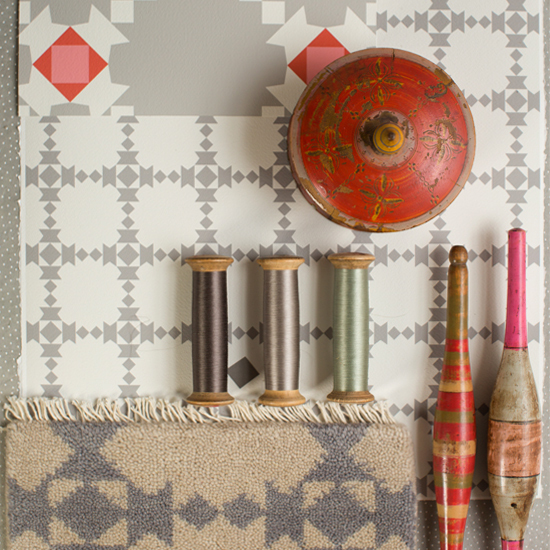 Traditional wooden spindles used in traditional textile production were the unlikely inspiration for the pattern. Applying her creative process the design becomes abstracted yet still visibly informed by its origin. The result is something thoroughly contemporary shot through with the warmth of familiarity. 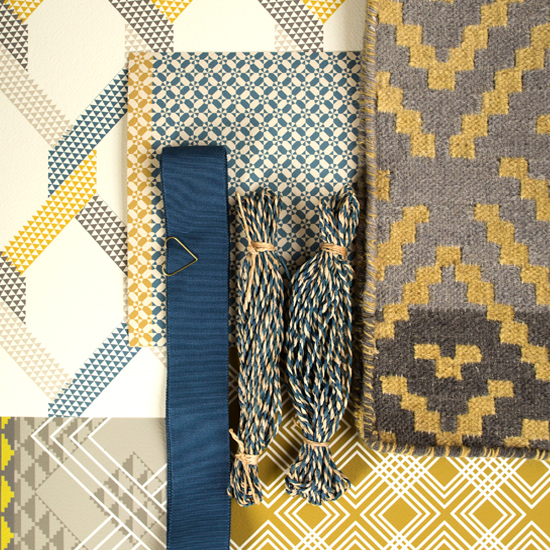 The striking geometric pattern was interpreted across a number of techniques, applications and products. A beautiful rug called, “Spindle” was crafted using an intense, handknotting technique. 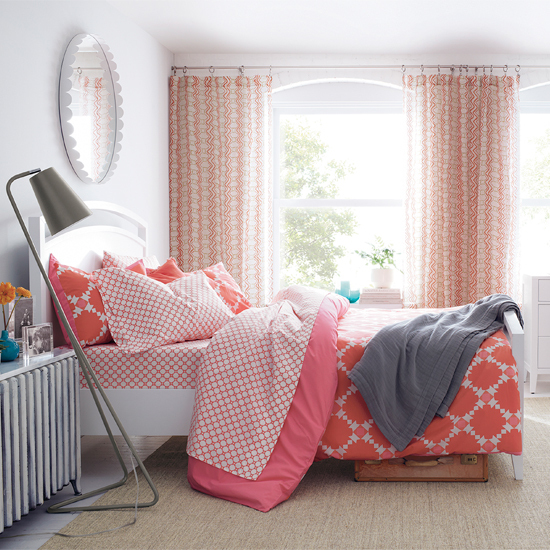 The pattern was developed into a vibrant 3 colour design for use on the eponymous “Genevieve” bedlinen collection. It is said that a beautiful future always contains grains of the past. A characteristic of Genevieve’s work is the distillation of historic form recut with a contemporary graphic verve. The collaboration with Crate and Barrel defines this essence. The parquet floor patterns and the stained glass of the Tudor era were the inspiration for the’Twine’ rug collection launched in 2014. 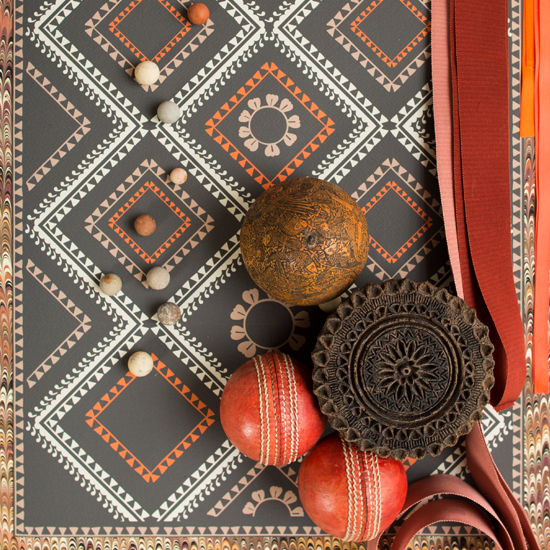 The simple interlocking shapes were hand tufted using richly textured and deep ochre wool to create a beautiful and sumptious rug which quickly became a favourite piece. Using the powerful simplicity of “Twine” Genevieve has evolved the design. Without compromising the original purity of form, the pattern has been cleverly, and very beautifully, interpreted across a wider collection of pieces. These range from cushions, throws and curtains through to dining and kitchenwear. The success of the range is a satisfying acknowledgment to the delightful simplicity of the original piece. A life’s passion, knowledge and experience of working with pattern and materials informs Genevieve’s instinctive ability to cross pollinate a design across a wide range of end products. This enriches and adds value to the collection. This, of course, creates a desirable interest, versatility and longevity for the brand and the product. Inspiration is everything and everything is inspiration. All of Genevieve’ work is a creative distillation of a vast, and ever evolving, trove of inspiration. Historic artefacts, indigenous objects collected from extensive travels, organic form and other cultural references are trace elements in all of her work. It is a process true to artistic theory. The results of the pursuit are a delightful gesture against the mass produced, homogenised and bland. A humble celebration of intelligent creativity. Timeless, contemporary elegance.